Venezuelan born painter Gabriela Fernandez uses psychedelic colors to create fantastical landscape scenes. 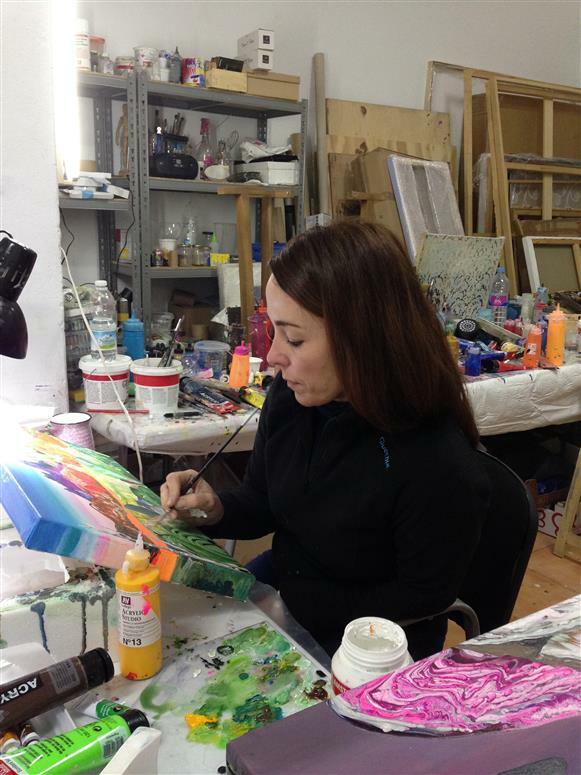 She applies mixed media in layers to produce rippling, swirling forms on each canvas. The mountains and valleys seen in Gabriela’s compositions are inspired by her travels and childhood in Venezuela. “Often it is the memory of an environment that forms the initial idea behind the work,” says Gabriela. Building from her memories, Gabriela also relies heavily on her imagination to complete a landscape. The artist currently resides in Spain where she enjoys being near the beach. My canvases are based on landscapes painted in an unconventional way. These works can be related to feelings and emotions and are shown through an intense color palette, in places that the spectator recognizes but have been transformed during the process of creation in which the paint finds its own shapes and layers, which ripple, pool and melt across the canvas. I use photography to document the places I visit. I gather material from a variety of sources, books, old and new photographs, etc. But often is the memory of an environment that forms the initial idea behind the work. My work is influenced by other landscape painters like David Hockney, because of his use of colour, April Gornik, for the depth in the meaning of her painting and Laura Owens , because of the contrast between reality and fiction in her landscapes. Also the psychedelic imagery samples of 1970s and Japanese landscape have had an impact in my painting. As an artist, even if my paintings refer to constructed landscapes and they are not specific to a particular event, exists inside me a discontent with climate changes and political conflicts which affect directly our environment. Even my paintings can express beauty; they also show the fragility of nature.